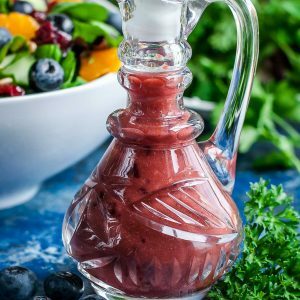 This Balsamic Blueberry Salad Dressing is ready to shake up your Spring and Summer salad game! 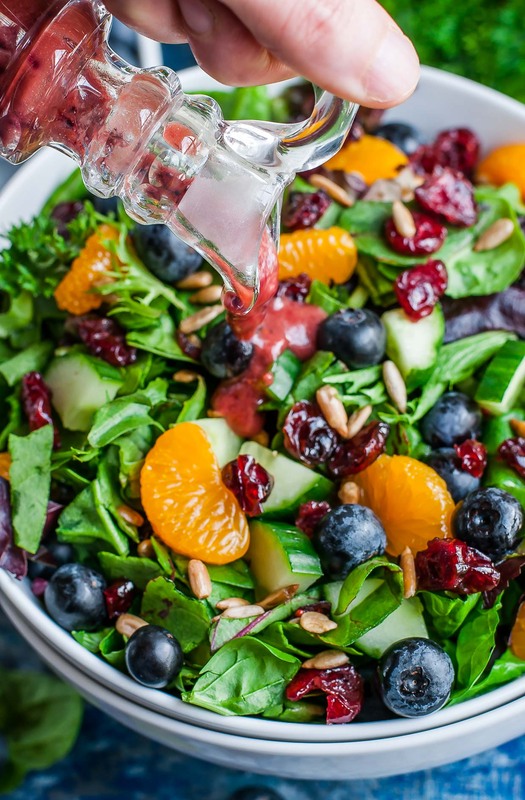 You’ll want to pour this fruity blueberry dressing on salads all season long! In a rush? Skip ahead to the recipe. Guess who has an epic case of writer’s block right now? Oh yes, this girl! I need to nip it in the bud STAT because I have a good 10+ recipes that I need to write up for you crazy kids. I’ve been a bit of a stress case lately, and when I get antsy I wind up cooking up a storm. I’ve done a few test batches of the most amazing veggie frittata, a spicy new twist on a classic dip, a new Instant Pot pasta dish that I’m pretty much losing my mind over, and so. much. more. All that’s left is to edit a million bajillion photos (EEEEK!) and write them up so y’all can join me in the kitchen. I love writing, I do. However I need to be in one of those magical “must-write-all-the-things!!!! !” moods to get any real work done. Though I hear home delivery of crusty pumpernickel bagels with cream cheese and steaming hot coffee work wonders… Ya know, if you want me to get a particular recipe up and on the blog in a timely manner. Wink Wink Nudge Nudge. Anywho! 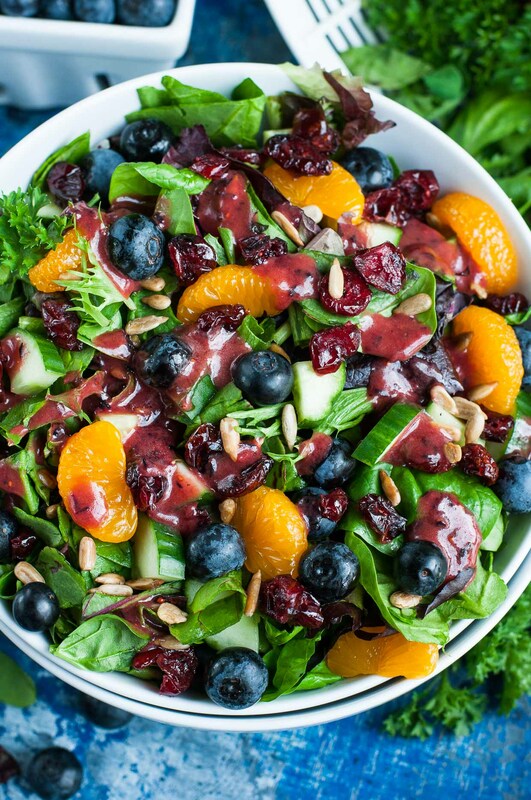 It’s blueberry season here in Florida and y’all need to make this dressing! I created this recipe for my cranberry blueberry spring mix salad but it’s great with so many awesome salads! Make up your own dream combo or even try it with one of my strawberry spiked salads (because strawberries and blueberries? match made in heaven yo!) Strawberry Kale Salad and Almond Crusted Goat Cheese Salad <– love them so! This recipe makes a bottle's worth of dressing (approx. 1.5-2 cups) which will keep great in the fridge for a few days. Only want a little? Feel free to cut the recipe in half - it's super easy to do! In a food processor or blender, combine all dressing ingredients except for the avocado oil. Blend until blueberries are completely pureed, then slowly drizzle in the avocado oil at the end. Once dressing is emulsified you're good to go! Pour it on all your favorite Spring and Summer salads! looking for more fun, fruity dressing recipes? I’m thinking I need to add a strawberry or raspberry dressing to my arsenal next! Stay tuned! 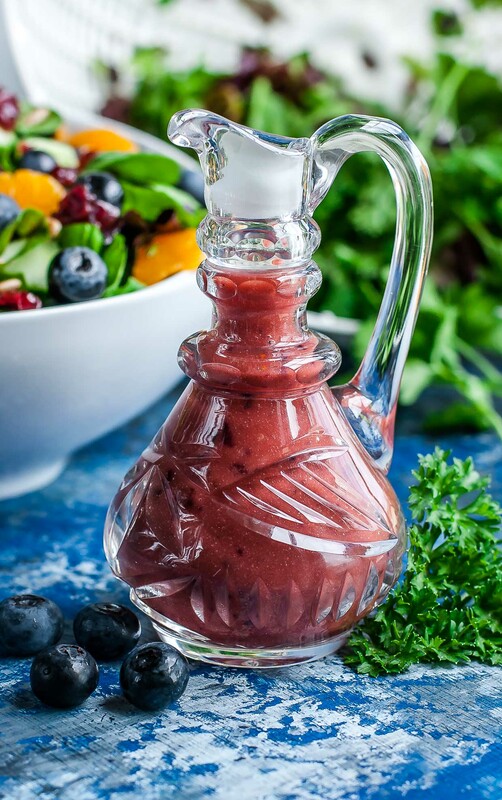 If you get a chance to try this balsamic blueberry salad dressing, let me know! Leave some love in the comment form below or tag your photos with @peasandcrayons on Instagram so I can happy dance over your creation. nice time of year for fresh blueberries and very creative inspiration to combine with balsamic as a blueberry dressing, thank you! The colour on this dressing is just so beautiful. This salad dressing is absolutely amazing! My new go to.